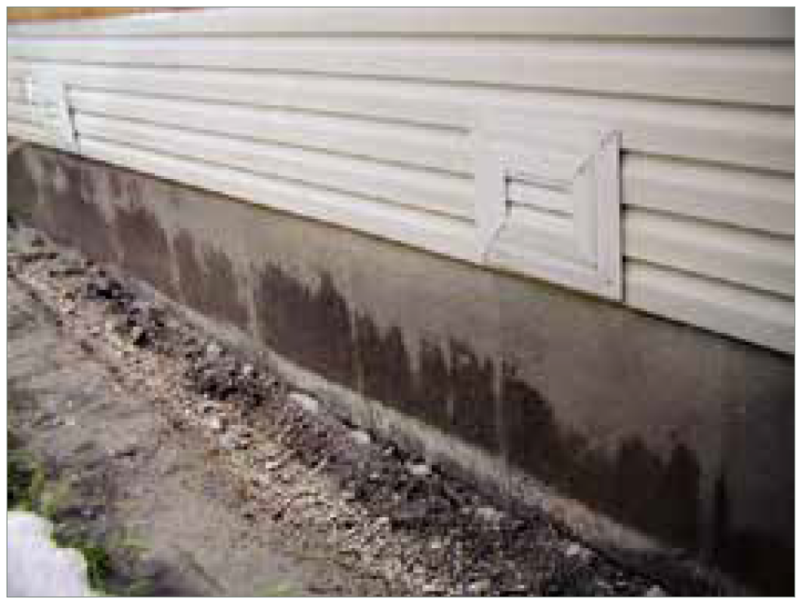 Moisture from the outside of a building from poor drainage can affect the slab inside and lead to floor failures. 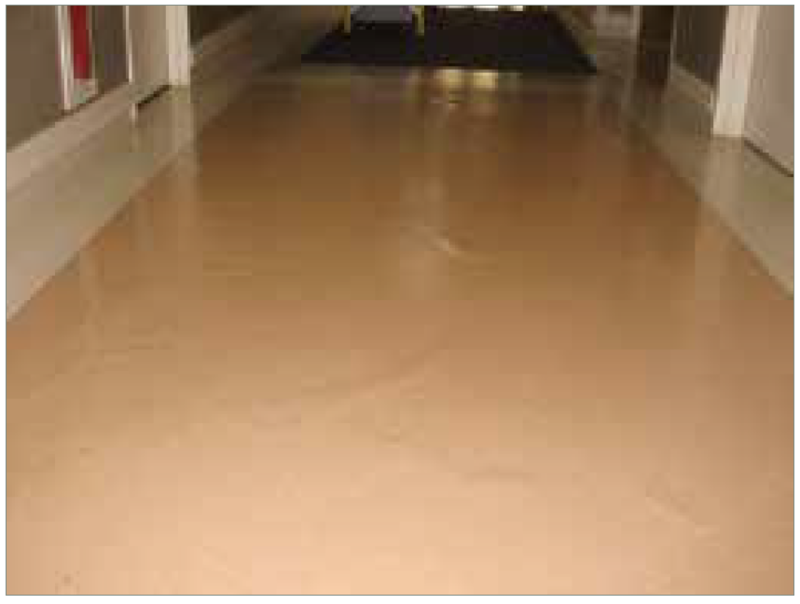 One of the most common problems in the floor covering industry continues to be floor failures related to excess moisture and high alkalinity at the surface of the concrete. All floor coverings are affected, including carpet, resilient, wood, laminates, coatings, stone, and tile. The symptoms include gaps between tiles, adhesive oozing, carpet buckling, tile cracking, bumps, dents, cupping, bubbles, wheel marks and more. If these problems are not corrected, issues of mold and bacterial growth, trip hazards from floor coverings which are not flat or slip and fall accidents because of unstable floors can create liabilities and cost owners, installers and/or manufacturers countless dollars. Failures can occur because new concrete has not dried fully, on or below grade slabs are placed without a vapor retarder, or by outside factors such as broken pipes or poor grading or drainage outside building. Many failures occur because of false assumptions about the nature of concrete floor slabs. For example, it cannot be assumed that older slabs are immune from these types of problems. Those old slabs may not have a proper vapor retarder beneath them. Another common assumption is that slabs above the ground will not be a risk for moisture. However, with the use of lightweight concrete and/or metal deck construction, these slabs often take longer to dry than a standard mix concrete on ground level. 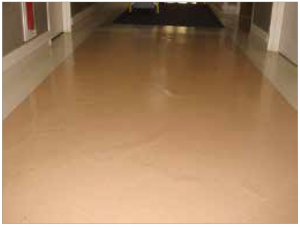 This sheet vinyl was installed in a 50-year-old hospital, and no moisture testing was done prior to installation. For reasons unknown, the previous tile floor did not exhibit any problems, but the new floor did. Moisture testing could have warned of this potential problem. In the case of new construction, drying time is often misunderstood; “28 day cure” is a term often misused to assume the slab is dry enough for a new floor. However, curing and drying are two different things. Curing is the chemical reaction between the ingredients that bonds them together and drying is the evaporation of the excess water after curing. Slabs can take months to be dry enough to cover with flooring, not just 28 days. There is an industry standard that covers many of these issues, ASTM F710 Standard Practice for Preparing Concrete Floors to Receive Resilient Flooring. On the topic of moisture, F710 goes into detail about above-grade slabs and those on metal deck and why they take longer to dry. It also calls out the difference between curing and drying. Most importantly, F710 states “All concrete slabs shall be tested for moisture regardless of age or grade level,” and this language is also included in virtually every type of floor covering manufacturer’s guidelines. Since you can’t see, smell, or feel moisture emitting from concrete, there is no easy way to test for it. Moisture meters are sometimes used, but this is just a spot test for surface moisture at that spot in the slab at that point in time, so the industry does not recognize moisture meter testing on concrete as a way to determine if a slab is ready for a new floor. A newer method, ASTM F 2170, Standard Test Method for Determining Relative Humidity in Concrete Floor Slabs Using In Situ Probes (known as the RH Method) became an ASTM standard in 2002. By drilling into the slab, the RH method measures the percentage of humidity inside the slab, as opposed to the Calcium Chloride test, which only sees a short way into the surface. The RH Method is a high-tech way to accurately predict the future moisture movement from the inside of the slab to the surface. The importance of testing concrete before installing a floor cannot be overstated, but who should do the testing is often misunderstood. 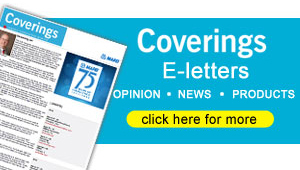 In October 2001, a group of 10 trade associations worked together to release The Floor Covering Industry White Paper Position Statement on Moisture Emission Testing. 1. It is unreasonable to expect flooring installers to be responsible to correct concrete problems that they have had no role in creating. While they are continually encouraged to develop sufficient expertise to anticipate and ask the proper questions for evaluation of potential concrete/flooring problems, it is not their responsibility to correct problematic substrate conditions created by others. 2. General contractors and flooring contractors must be made aware of all of the test results. Most flooring manufacturers have specific test criteria and limits required for the moisture conditions of concrete. The flooring contractor should only commence installation once these requirements are met and should not begin flooring installation if any requirement is outside of the manufacturer recommended limits. 3. One of the best ways to ensure fair and responsible testing is to specify that it be done by a third party independent and/or certified testing company. Their results are clear and unbiased. The project can then proceed in accordance with the findings. Independent testing assures that trained technicians follow the proper test protocol so that the results cannot be questioned, and they do so without any bias or vested interest in the results. For new slabs, accelerating drying can be done by enclosing the building as soon as possible, maintaining close to “in service’ temperature, removing curing compounds or sealers from the slab and keeping the air moving. 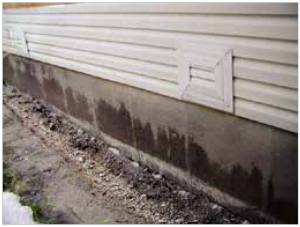 In some cases the same type of dehumidification equipment that is used to remediate flood damage can be used to dry out the concrete. If there is no time to wait or if there is no vapor retarder beneath the slab, surface applied systems may need to be applied and selecting these systems is best done in consultation with someone who has experience in this area.